My jazz portrait of Annie Hawkins depicts her guest starring with Sammy Rimington’s International Jazz Band. Thrillingly vivacious, Australian born Annie might be petite but she is a virtuoso jazz artiste. 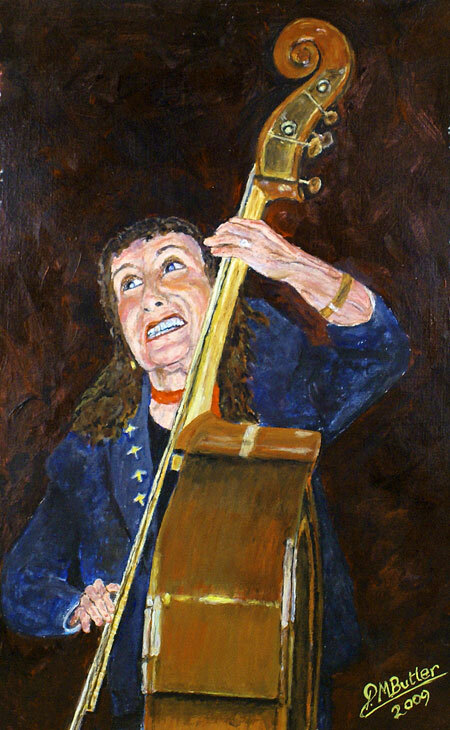 She has been described as “driving yet sensitive” and “Europe’s first lady of the double bass!” Annie moved to Britain in 1962, working with Ken Colyer in the 1970s and then with Sammy Rimington. Not only I was thrilled to present my jazz painting and portrait to Annie at the 2011 Autumn Jazz Parade in Hemsby where she made a surprise visit to play with the Rae Brothers New Orleans Jazz Band, I was over the moon with her oh so typically effusive display of delight! Thank you, Annie, for your kind comments. 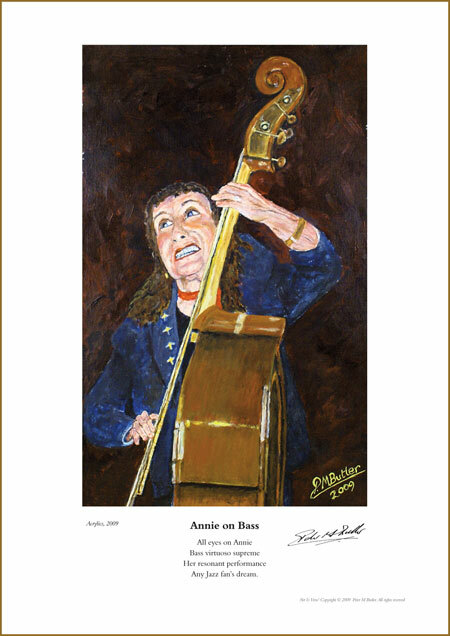 Fine art print of the jazz portrait of Annie. Fine Art Giclée Prints of this portrait are available, with or without my descriptive poem. Simply email: peter@jazzandjazz.com to place your order and help support jazz. Inspiring indeed! And I didn’t know that about Annie. Makes her all the more a remarkable lady as well as a wonderful jazz bassist. Thank you, Mark Waddington!